The people of Kazakhstan have made their preferences clear. Following the re-election of Kazakhstan President Nursultan Nazarbayev in April 2015, I wrote an article “Understanding Kazakhstan’s Politics” to offer insights into the domestic factors shaping Kazakhstan’s political trajectory. Almost a year later, following the recent elections for the Mazhilis, the lower house of parliament, it is appropriate to once again examine Kazakhstan’s internal political development. I recently travelled to Astana for the elections, where I was able to interview a former Mazhilis deputy, two Mazhilis candidates, and political operatives, among others. The results of the elections were largely as expected. 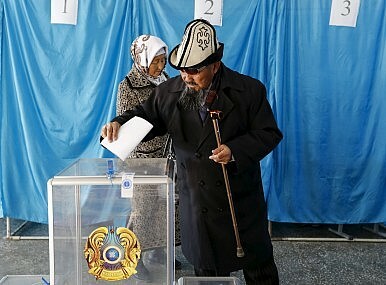 The ruling Nur Otan party won 82.20 percent of the vote and 84 seats, while the Communist Party of Kazakhstan (CNPK) and the Ak Zhol Democratic Party secured 7.14 percent and 7.18 percent of the vote, respectively, endowing each of those two parties with seven seats in the Mazhilis. None of the three smaller parties, Birlik, the Social Democratic Party (OSDP), and Ayul, reached the 7 percent necessary threshold to gain representation in parliament. This election effectively preserves the status quo, as in the recently dismissed session of the Mazhilis, Nur Otan held 83 seats, Ak Zhol 8, and the CNPK 7. The Organization for Security and Co-operation in Europe (OSCE), which observed the elections, concluded that they were “efficiently organized, with some progress,” but still failed to uphold Kazakhstan’s stated OSCE commitments. The elections did not present voters with “genuine political choice” and there was a “lack of pluralism of opinion in the media.” The OSCE added that Nur Otan’s dominant position in national politics has effectively obscured the distinction between the state and political party. Realizing the Kazakhstan’s stated OSCE commitments requires the people of Kazakhstan to accept “the importance of pluralism with regard to political organizations” and other norms endemic in other OSCE liberal democracies. While the government of Kazakhstan has pledged its commitment to democratic development, do the people of Kazakhstan really want a Western-style liberal democracy? Is the Kazakhstani electorate ready for this form of government? Surely, the people of Kazakhstan are eager to be a member of the developed nations club, and they desire the prosperity of a liberal democracy, but there is little evidence to suggest that they are ready to embrace the norms, behaviors, and traditions characteristic of societies with a high degree of political pluralism, such as those found in other OSCE liberal democracies. Kazakhstan’s conservative culture does not lend itself to lively, and often confrontational, political life. This is not to suggest that the people of Kazakhstani are anti-freedom or pro-authoritarianism; rather, to most Kazakhstanis, at this point in the country’s historical development, realizing a liberal democratic political culture that would satisfy the country’s OSCE commitment is of secondary importance to the values of national unity, security, sovereignty and stability. Security is a central tenant of Kazakh culture. As a historically nomadic people reared on the Eurasian steppe, devoid of the defensive benefits of a sedentary lifestyle and vulnerable to invasions from rival nomadic tribes, Kazakhs consider the preservation of unity among friends, family and co-nationals to be invaluable to the existence of the Kazakhstani state. Kazakhs’ sensitivity to border threats manifests today in the country’s multi-vector foreign policy, which emphasizes friendship with all peace-loving peoples. Within Kazakhstan, security, unity and solidarity are predominant tropes in national politics, as the pre-election platforms of all six parties highlighted the importance of a unified Kazakhstani nation in the face of an increasingly dangerous and uncertain world. After all, Kazakhstan is a land-locked state neighboring Russia and China, and not too far from the conflict-ridden regions of Afghanistan, Syria and Iraq. The results of the 2014 World Values Survey confirm Kazakhstan’s preoccupation with security. More than half of Kazakhstanis polled feel “quite secure,” and yet 72 percent of Kazakhstanis are either “very much” worried or are “a great deal” worried about losing their existing job or not finding a new one. The collapse in global oil prices since late 2014 caused the government in October 2015 to readjust the 2016 national budget based on an average oil price of $40/barrel, down from an original assumption of $80/barrel in the 2015 budget. With oil revenues generating in excess of 50 percent of the government’s budget, Kazakhstan’s economy is sensitive to fluctuations in global oil prices. Under pressure from global markets and internal financial distress, in August 2015 the Central Bank of Kazakhstan made the prudent decision to float the Kazakhstani tenge (KZT). This move, while necessary for the country’s long-term financial development, caused short-term economic hardship as the KZT depreciated 44 percent – from 185 KZT/USD to 330 KZT/USD – between August and December 2015, slashing the population’s real income. Beyond economic volatility, some 71 percent of those polled in the World Values Survey indicated they were “very much” or “a great deal” worried about a war involving their country, another 80 percent were worried about a terrorist attack, and 65 percent were concerned about a civil war. Generally, the results suggest that people of Kazakhstan are worried about the future – as the country ranked above Ukraine, and below Pakistan in this category. Yet, Kazakhstan ranked as one of the top 13 nations in the survey for countries that perceived the least threat to their physical security. To that end, Nazarbayev is regarded the guardian of Kazakhstan’s national unity, even by members of the opposition. An Ak Zhol official noted, the president “is the only leader capable of uniting all of Kazakhstan’s over 120 nationalities, because his first act as president was to secure border agreements with China and Russia.” Another Ak Zhol candidate observed, “whether we like it or not, Nazarbayev is our future,” and “we live in a dangerous world, and Kazakhstan has not experienced any terrorism or civil war, thanks to Nazarbayev.” Meanwhile, some former Nur-Otan officials shared that despite their departure from the party, they continued to vote for Nazarbayev, as he is the only one capable of ensuring national unity. Kazakhstan’s legislative culture reinforces the super-presidential system. While the legislature influences politics through the appropriation process, senators and deputies are not nearly as active in the legislative process as they are in the U.S. Congress or in Western European parliaments. Deputies themselves do not draft legislation, but fulfill the legislative mandate presented by the executive branch at the beginning of the term. One former Mazhilis member recalled how deputies worked around the clock, including weekends, in the fall of 2008, just as the real estate bubble hit Kazakhstan, to ratify a series of anti-crisis measures presented by the president. While legislation is amended during the review process, generally, deputies try not to change more than 50 percent of the original text, as doing so would alter the bill’s original intent, and require resubmission to the executive. Deputies therefore restrain themselves from making significant modifications in order to ensure the bills are passed. Moreover, similar to the party discipline that dominated Soviet-era politics, deputies in the Mazhilis vote as a unified bloc, in accordance with the policies set by their respective the party leadership. Any diversion from the party line could be perceived as an abandonment of party ideology. Insofar as Kazakhstan lacks a vivacious legislative culture, it is natural that the political pluralism observed in long-established OSCE liberal democracies lags. The preoccupation with security also influences how the people of Kazakhstan perceive elections. In an interview, one political operative claimed that while it may be a good idea to reinstate the system self-nominations for the Mazhilis that existed prior to 2007, when a party-list system was implemented, so as to allow for greater political pluralism, the current system of presidentially-appointed Akims (regional governors) should continue. Allowing the direct of elections of Akims could be dangerous, as citizens in the border regions of Northern and Western Kazakhstan would likely elect a pro-Russian leader who would ally with Russia in the event of a crisis, and stimulate the disintegration of Kazakhstani unity. In the aftermath of the Ukraine crisis, an elected pro-Russian official would provide a prerequisite for future potential Russian aggression. This is why the super-presidential system works – it preserves Kazakhstan’s status as a united, unified, and secured state. Kazakhstan, a new state with a government that has been in existence for just 25 years, is not yet a liberal democracy. The country lacks the true political pluralism found in other OSCE liberal democracies that have evolved over hundreds of years. But this is the stage Kazakhstan is at in its historical development, and the people of Kazakhstan have made it clear that in a dynamic global economic and security environment, they favor security, unity and predictability. To them, this is Nazarbayev and the Nur Otan party. Dena Sholk, author of The Sholk Road Adventures, is an independent Eurasian analyst and a former Fulbright scholar in Kazakhstan. Finding Kazakhstan’s Troll FarmsThe Kok Zhailau Problem and Kazakh Civil SocietySnap Presidential Elections Called in Kazakhstan. But Why?Is This the End of the Nazarbayev Era?Who Will Run Post-Nazarbayev Kazakhstan?